Dental model trimmers are necessary in a dental laboratory for trimming gypsum or refractory casts. The first classification of dental model trimmers is choosing a wet, dry or combination wet/dry model trimmer. If using a dry dental model trimmer, be sure a dust retraction device is in place. Power can vary between ¼ HP and ¾ HP, but on average are about ½ horsepower. This enables enough power for quick and efficient trimming and allows for frequent laboratory use. If your laboratory is a high volume facility, it may be wise to choose a higher-powered dental model trimmer. Another feature to consider is choosing a single wheel or dual wheel model trimmer. A dual wheel dental model trimmer will feature one course wheel for rough cutting and a second fine wheel for finishing work. 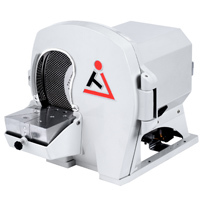 This eliminates changing the wheel throughout the trimming process, which can save time and is very convenient. Single wheel dental model trimmers may feature a reversible wheel, a carborundum side and a diamond side. A diamond wheel is extremely hard and may last 2 to 5 years depending on use.